The European Space Agency observed for the first time in the history of sciences the emissions of carbon dioxide at a regional scale. This enable us to see from where these greenhouse gas emissions come from and thus to act locally to decrease them. As the map above shows, the most emitting regions are located in the Netherlands, Northern Belgium and the most western part of Germany. Using data from the SCIAMACHY instrument aboard ESA’s Envisat environmental satellite, scientists have for the first time detected regionally elevated atmospheric carbon dioxide – the most important greenhouse gas that contributes to global warming – originating from manmade emissions. (…) Predicting future atmospheric CO2 levels requires an increase in our understanding of carbon fluxes. 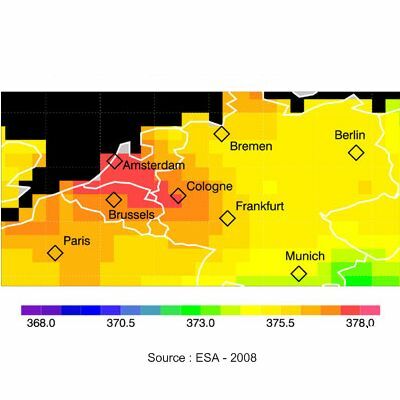 (…) As illustrated in the image, the findings show an extended plume over Europe’s most populated area, the region from Amsterdam in the Netherlands to Frankfurt, Germany. Carbon dioxide emissions occur naturally as well as being created through human activities, like the burning of fossil fuels (oil, coal, gas) for power generation, industry and traffic. Significant gaps remain in the knowledge of carbon dioxide’s sources, such as fires, volcanic activity and the respiration of living organisms, and its natural sinks, such as the land and ocean. “We know that about half of the CO2 emitted by mankind each year is taken up by natural sinks on land and in the oceans. We do not know, however, where exactly these important sinks are and to what extent they take up the CO2 we are emitting, i.e., how strong they are. “We also don’t know how these sinks will respond to a changing climate. It is even possible that some of these sinks will saturate or turn into a CO2 source in the future. With our satellite measurements we hope to be able to provide answers to questions like this in order to make reliable predictions,” Buchwitz said. By better understanding all of the parameters involved in the carbon cycle, scientists can better predict climate change as well as better monitor international treaties aimed at reducing greenhouse gas emissions, such as the Kyoto Protocol which addresses the reduction of six greenhouse gases. Last year, European Union leaders highlighted the importance of cutting emissions from these manmade gases by endorsing binding targets to cut greenhouse gases by at least 20 percent from 1990 levels by 2020. This is interesting news indeed, now I would like to see a similar map for the whole European Union. Hopefully it will be released quite soon. Be sure that I will keep you posted if it happened. So, for this and for much more, stay tuned and don’t hesitate to leave your opinion on this topic and write a comment as I would gladly read you.